Enter your school email. If you don’t have a school email that's OK! However, as a first-time visitor, we recommend school emails for an experience customized to your curriculum. We'll email you a verification code to access, type those numbers in when prompted. To log in, provide your email associated with your Osmosis account (this email does not have to be your school email, it's the email on your Osmosis account), then we’ll email you a verification code to log into the app. Here you can turn on/off push notifications or snooze notifications for the rest of the day. 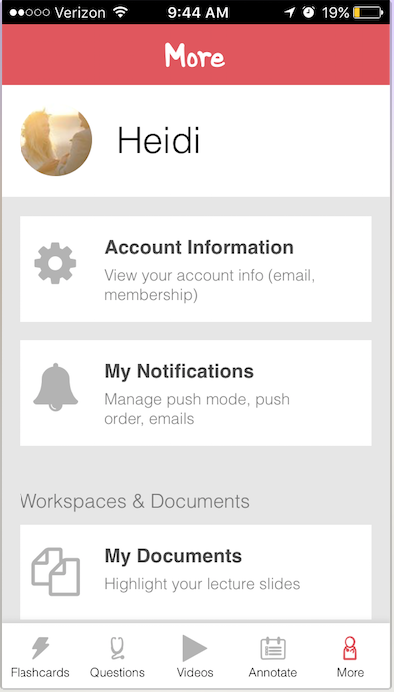 More > Account information > Picmonic integrations can be turned on/off here.